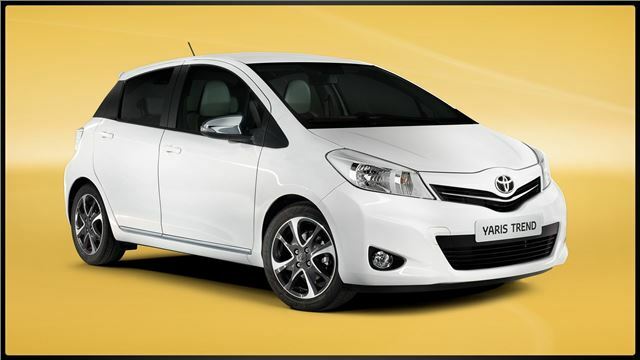 The popular Toyota Yaris range has been boosted by the arrival of the 2013 Trend, a more sporty-feeling edition. Also, new appearance packs are also available for the TR and SR models, adding appeal for younger buyers. The new Yaris Trend has smartened up exterior styling and some new interior finishes, textures and colours, and the overall effect is to give the car a more fashionable feel. It's available as a five-door only, and powered by the 1.3-litre petrol engine, with either a six-speed manual or automatic transmission. You can spot a Trend by its chrome highlights up front (headlamps and grille), blacked out B- and C-pillars and chrome door sills and door mirror covers. The 16-inch alloys are machine-finished in a unique two-tone design. Look out also for a roof spoiler and LED rear lamp clusters. Paint colours are Pure White, Tyrol Silver, Burning Red and Decuma Grey. Inside, it's treated to an appealing duo-tone theme, with strong, contrasting black and white trim and surfaces. Trend-unique features include a shorter gear selector, new centre console treatment, and ochre-coloured stitching. New seat trim is also in, you guessed it, contrasting black and white. Appearance packs, which echo this, are also available for the Yaris TR or SR - available for £250.